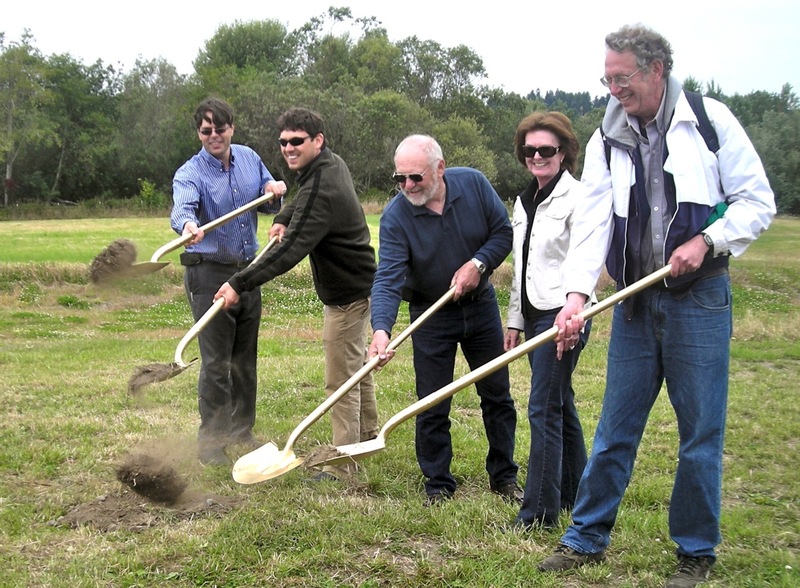 VALLEY EAST – With golden shovels in hand, Kenneth and Ellen Zanzi along with Mayor Mchael Winkler and designers from LACO Associates broke ground on the Mad River Parkway Business Park last Thursday, July 12. The mixed-use community will offer space for light industrial, commercial, professional office and residential units from Giuntoli Lane to the Mad River. The desire is for the property to enhance the area as well as protect the existing ecological resources. The design plan includes rain gardens, permeable paving for rainwater retention and groundwater replenishment. Bike and pedestrian paths will provide access to all areas of the community as well as public access to the Mad River. Also included are a riparian zone interpretive trail and lighting. Ambitious as it is, the Mad River Parkway project is just part of a larger vision for a grand refurbishment of all of northern Arcata. Other elements include the extensive street improvements, parks and paths for Valley West, as well as the Mad River Community Hospital Wellness Campus, which will inlude medical and educational facilities, parks and housing. All of the projects will be linked with trails. LACO Associates building designer Julian Berg is particularly proud of incorporating green building and sustainable design in the parkway project. “It is designed well, to work well,” Berg said. The property has been in Ellen Zanzi’s family since the 1940s. It was owned by her father, who originally intended it to be a dairy but ended up renting it as grazing land for cattle. It has been 20 years since Ellen Zanzi first had the idea to develop the property. The Zanzis went to the City with their ideas in 2005. 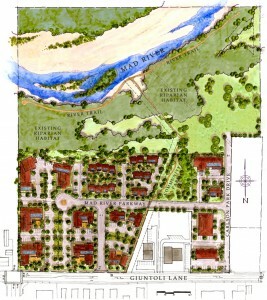 The City Council approved the project February, 2010. Seventeen lots will be ready for sale in the next four months. Of the 17 lots, four are for apartments or multi-family residential space. The city has designated a certain percent of the housing to be low income. 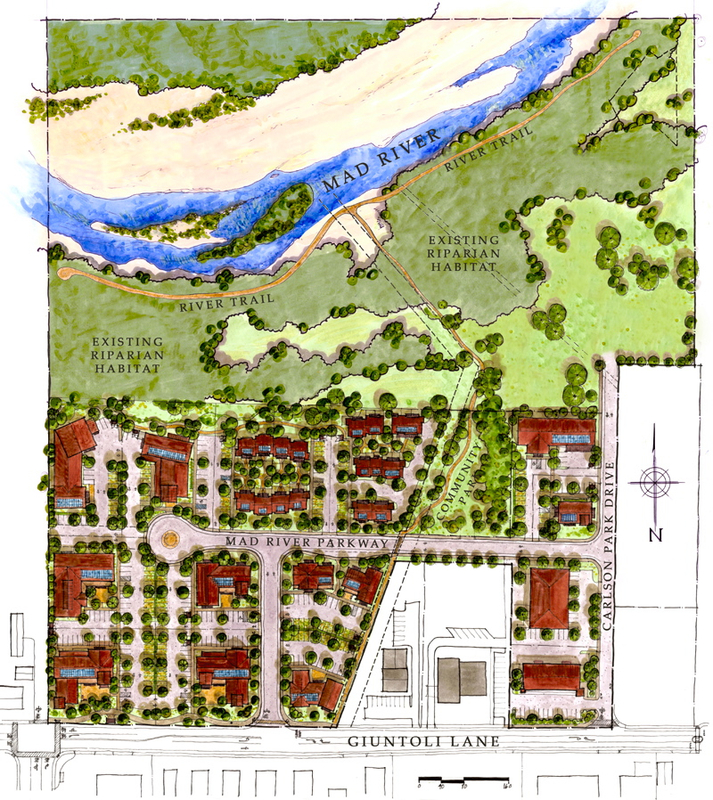 For more information about the Mad River Parkway Business Center, contact Ken and Ellen Zanzi at (707) 834-0328. This entry was posted on Wednesday, July 25th, 2012 at 9:28 am	and is filed under News, Environment. You can follow any responses to this entry through the RSS 2.0 feed.